EMC Planning Group serves as City of Seaside staff support for the Seaside Resort project on the former Fort Ord military base. Our staff processed development applications and related ordinance amendments, represented the City at field trips and hearings, prepared the project EIR, prepared the staff report, resolutions, and findings for the Board of Architectural Review, Planning Commission, City Council, and Fort Ord Reuse Authority. EMC Planning Group staff currently provides mitigation and condition monitoring services as the project develops. The project is the development of a major destination resort hotel, timeshare, and residential development within two existing golf courses. The project involved the relocation of several existing golf course features and adherence to design standards. Significant issues addressed included water supply, affordable housing, timeshare regulation, and establishing nexus and proportionality for services fees. The project required several amendments to the municipal code. Changes focused clarification within the zoning ordinance of the Fort Ord Reuse Plan’s policy regarding integration of recreational, commercial, and residential uses. 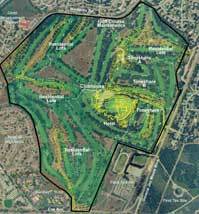 In addition, development standards were revised to allow a planned development approach within the unique housing areas associated with the golf courses. A timeshare ordinance was added to the municipal code. EMC Planning Group staff met with the applicant throughout the approval process to refine the project to meet City goals, and address planning issues that arose. A major issue was the calculation of ad-hoc fees, since the City did not have the necessary fee programs adopted. EMC Planning Group prepared a detailed analysis of existing services levels and proportional shares for extension of services to the project. The fee analysis was the basis for negotiation of the development agreement. Major environmental issues addressed in the EIR included traffic, water supply, aesthetics, biological resources, hazardous materials, and emergency access.